Today, I’m excited to tell you about the Amazon API Gateway native integration with AWS WAF. Previously, if you wanted to secure your API in Amazon API Gateway with AWS WAF, you had to deploy a Regional API endpoint and use your own Amazon CloudFront distribution. This new feature now enables you to provision any­­ API Gateway endpoint and secure it with AWS WAF without having to configure your own CloudFront distribution to add that capability. In Part 1 of this series, I described how to protect your API provided by API Gateway using AWS WAF. In Part 2 of this series, I described how to use API keys as a shared secret between a CloudFront distribution and API Gateway to secure public access to your API in API Gateway. This new AWS WAF integration means that the method described in Part 2 is no longer necessary. The following image describes methods to secure your API in API Gateway before and after this feature was made available. AWS WAF securing CloudFront endpoint only. AWS WAF securing Amazon API Gateway endpoints natively. For this walkthrough, you can use an existing Pet Store API or any API in API Gateway that you may already have deployed. 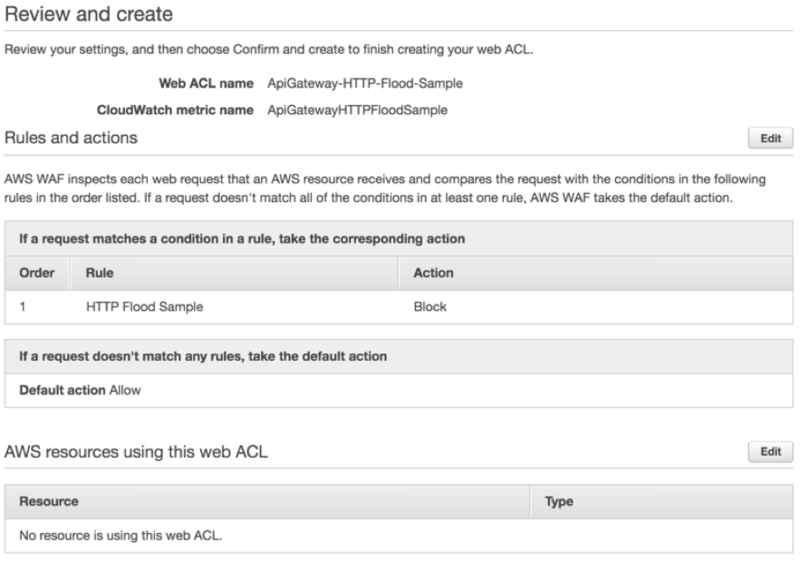 You create a new AWS WAF web ACL that is later associated with your API Gateway stage. Open the AWS WAF console. For Web ACL Name, enter ApiGateway-HTTP-Flood-Sample. For Region, choose US East (N. Virginia). Choose Next until you reach Step 3: Create rules. Choose Create rule and enter HTTP Flood Sample. For Rule type, choose Rate-based rule. For Rate limit, enter 2000 and choose Create. For Default action, choose Allow all requests that don’t match any rules. Confirm that your options look similar to the following image and choose Confirm and create next. Open the Amazon API Gateway console. Under Web Application Firewall (WAF), choose ApiGateway-HTTP-Flood-Sample (or the web ACL that you just created). AWS WAF provides HTTP flood protection that is a rate-based rule. The rate-based rule is automatically triggered when web requests from a client exceed a configurable threshold. The threshold is defined by the maximum number of incoming requests allowed from a single IP address within a five-minute period. After this threshold is breached, additional requests from the IP address are blocked until the request rate falls below the threshold. For this example, you defined 2000 requests as a threshold for the HTTP flood rate–based rule. Artillery, an open source modern load testing toolkit, is used to send a large number of requests directly to the API Gateway Invoke URL to test whether your AWS WAF native integration is working correctly. Open the API Gateway console. In the left navigation pane, open the PetStore API. Choose Stages, select prod, and copy the Invoke URL value. With this command, Artillery sends 2000 requests to your PetStore API from 10 concurrent users. By doing so, you trigger the rate limit rule in less than the 5-minute threshold. For brevity, I am not posting the Artillery output here. As you can see from the output, the request was blocked by AWS WAF. Your IP address is removed from the blocked list after it falls below the request limit rate. As you can see, with the AWS WAF native integration with Amazon API Gateway, you no longer have to manage your own Amazon CloudFront distribution in order to secure your API with AWS WAF. The AWS WAF native integration makes this process seamless.